Do you hate wearing a seatbelt? Do you love driving drunk? 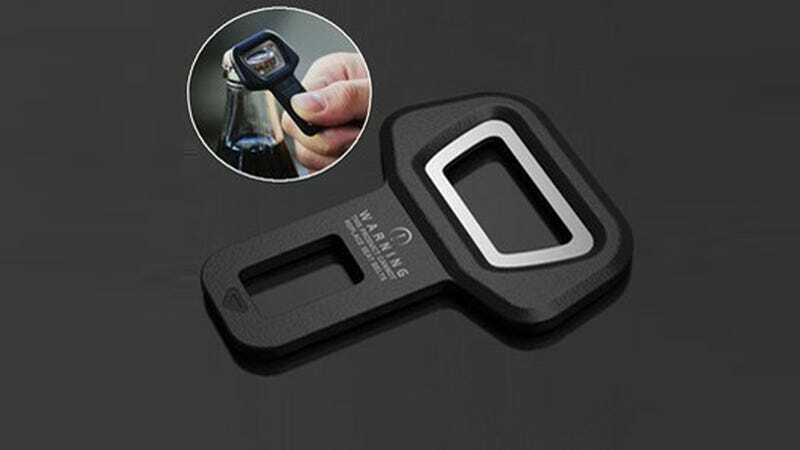 Here's a cheap little device to help you out, courtesy of the Chinese auto accessory industry. You see, it's a little seatbelt buckle without a seatbelt attached. Just plug it in and you can drive around without any of those annoying beeps or chimes that remind you how your face could get hurled into your dashboard during an accident. Car News China has a whole collection of these little devices, from Disney characters (fun for the kids!) to guns, to Porsche crests. How much do they cost? Chinese innovators sell zillions of different kinds, all priced between 3 and 15 yuan, or between 48 cent and 2.4 USD. The particular model pictured at the top doubles as a bottle opener, and while the promotional picture shows some kind of soda, we would bet that Tsingtao is the only thing it'll be opening. Not wearing your seatbelt is against the law in China, but buying one of these isn't. It should go perfectly with your also-legal fake seatbelt t-shirt.